The entire trip was delightful. The program was well organized and each painter received excellent comments and instruction at each enchanting location. My room was perfect – I loved the balcony overlooking the pool. Isabel and Tom were so helpful, supportive available and always ready with a smile! This has been a wonderful experience, full of new ideas, new techniques, all enhanced by the beautiful surroundings. The program surpassed my expectations, the instruction was good, the mix of people was good and the level of motivation was high. The cultural workshops were a great addition to the program and the field trips were a real high point for me. I’ll never forget it! The program definitely contributed to my development as an artist. 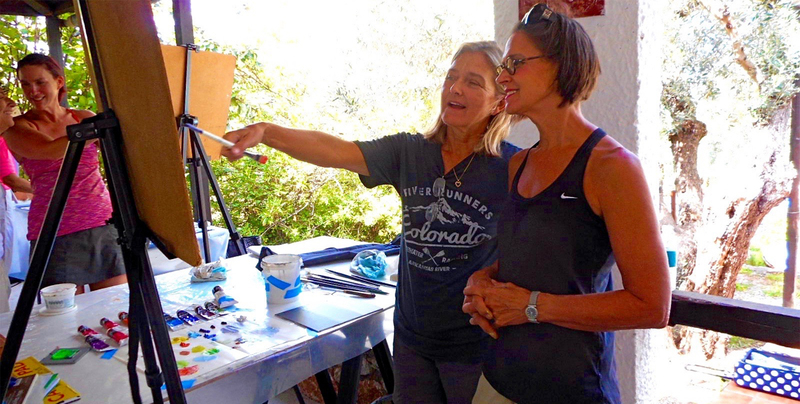 Our instructor was able to tune into the artistic needs of each of us and offer support. The field trips were a fabulous part of the program, providing cultural understanding, a change of work pace and visual and aesthetic experiences. Cultural workshops were outstanding. The program was extremely well run and they made everyone feel secure and at home. It was all great fun and a tremendous artistic experience! It was an outstanding trip and cultural experience; I knew it would be fun but I never imagined how rewarding this program would be! I was delighted with Greece; the beauty of the country and the hospitality of the Greeks. I loved the painting sessions in the morning and critiques in the evening. Plenty of helpful informative handouts and maps and an excellent balance between painting, cultural events and camaraderie. My accommodations overlooking the sea were perfect. I would do this again in a heartbeat! It was a challenging and magical experience that was rich and full of surprises! Our instructor was accessible for all the input and aesthetic advice we needed and was always sure to point out the best aspects of our work. The cultural workshops were an added feature that helped to truly understand Greece. Travel arrangements and preparations were great. I could not have imagined a more beautiful site for the program! Tom and Isabel were wonderful hosts. Thank you for everything! The program was full of joy and humor with a great group of people – and inspirational for my art. The program structure was just right and our instructor, Elizabeth, was magnificent helping us get started. She lead us all the way and made us feel we had greatly moved forward. I loved the cultural workshops and Athens was great fun. I don’t want to leave this paradise! Not only a rich painting experience with a wonderful teacher – but a great opportunity to meet the Greeks and learn about their culture. It more than fulfilled my expectations, especially with lectures on Greek culture, meeting friends and being treated like your personal guests. The program was brilliant and I learned a lot. The painting sites were fabulous. It was sheer heaven! Thank you for a wonderful experience! This program allowed me to step outside the norm and make art from a new perspective. The instruction was wonderful with a lot of individual attention that really helped me focus and work in the direction I wanted. Everything was superb! Thank you! The program provided a wonderful introduction to Greek culture & history as well as a totally delightful art-making experience. The Del Sol room was delightful, walking to and from the outdoor studio was lovely and the fact that we were able to make art outdoors was fantastic! It was a wonderful experience in all respects! Thank you! I loved every minute of our journey from the moment we first gathered on the Plaka Hotel’s roof terrace to our last gathering there, with the moon shining like a spotlight on the Acropolis. You couldn’t have picked a more genial hotel, nor been better organized in shepherding us up, down, and around archeological sites, ferrying us to and from Skopelos, settling us into our studio space and lodgings, and responding to our individual needs. You fed us ideas and images of how life used to be at the Acropolis, the Agora, Skopelos, and Delphi so that we could dream of those different times and consider with greater clarity the times in which we are now living. I’m grateful to Alexandra for helping us in exploring ways to respond to the colors, shapes, and textures of Greece. What a wonderful chance you collaboratively gave us in such a beautiful place and in such good company! I, for one, am already longing to return. A wonderful sensory experience involving art, history, culture and the cuisine of Greece! Our instructor, Adria, was always available and very encouraging; she really advocated for a loose, personal art expererince. The background and context of the cultural workshops really helped inform the art making and will be a source of inspiration in the future. It was a wonderful two weeks!